Over the last few months, the internet and mass media have been ablaze with images of refugees escaping war and devastation in Syria by undertaking a long and perilous journey to Europe. The images, many of them quite graphic, have put the current refugee crisis at the forefront of political debate. For many of us, they are a reminder that war and capitalist economic policies take an incredible human toll. The videos, images, and accompanying stories also highlight the oppressive nature of national border controls and immigration policies. Refugees attempting to penetrate “Fortress Europe” have been met with violence, imprisonment, separation of families, and death. At the same time, the refugee crisis at Europe’s borders has led to a blossoming of mutual aid and solidarity networks as activists have attempted to challenge the European Union’s policies of policing, exclusion, and terror. Groups in Greece, Croatia, Germany, and other European countries have formed to provide direct services to refugees, to help transport them across borders, and to fight their government’s policies. Some of these groups have offered a radical critique of borders, of the economic and social dislocations caused by capitalism, and of the racism embedded in anti-immigrant sentiment. BAARC is holding a fundraiser to provide funds to one such group, Soli-Kitchen Convoy. The soli-convoy group are a network of people from across Germany who travel with a mobile kitchen to cook food and spread information at border hot-spots in Europe where refugees are passing through. The solidarity group is autonomously organized, does not affiliate with state or charity structures and fights for freedom of movement for all and against borders. 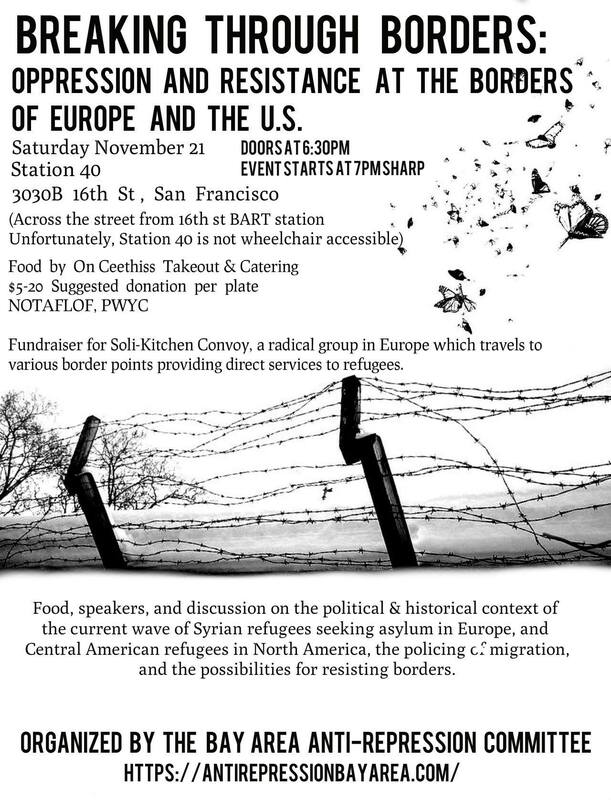 The Anti Repression Committee is organizing this event in the spirit of extending solidarity to people resisting state repression beyond the Bay Area. Finally, we want to make connections between the crisis in Europe and another refugee crisis much closer to home. While the Syrian crisis has been dominating the headlines, the large numbers of refugees fleeing Central America have been largely forgotten. Refugees fleeing violence and economic devastation, many of them young children, have increased significantly in recent years. The majority of them have headed north, attempting to reach the United States. They have faced their own violent repression at the border at the hands of the U.S. Border Patrol and the INS. At this event, we will have speakers who will provide a context and analysis of the causes of both refugee crises, as well as a discussion of the experiences of refugees and solidarity groups working at the European border. We will discuss the political possibilities for challenging the policing of borders and supporting refugees here in the United States. 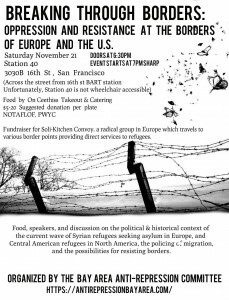 All funds will go to Soli-Kitchen Convoy, a radical group based in Germany which continuously travels to various border points to provide direct services to refugees. *please note that Station 40 is up two flights of stairs and is unfortunately wheelchair inaccessible.